The Sherburnes, descendants of the Norman de Mittons, built the Shireburne Chapel at All Hallows’ church, (aka. Mitton Church) in Great Mitton next to the original manor hall site of Ralph the Red. The Chapel was first started in 1440 and completed in 1595 by Sir Richard Shireburne. “Although there was a private chapel connected with the manor house (Stonyhurst), where mass was said four times a week, the rights of the parish church of Mitton were observed, the family baptisms, marriages, and burials being all performed within its walls.” A History of the Family of Sherborn”-Charles Davies Sherborn, 1901. The Catholic Shireburnes were all baptized, married and interred at the Protestant All Hallows with elaborate effigies inside the Shireburne Chapel. This Mitton church legacy was recognition of the de Mitton Norman ancestry of the prominent Catholic Shireburnes of Stonyhurst, no doubt hastened by Henry Vlll’s edicts toward the Catholic church and the subsequent Civil War and ascension of Oliver Cromwell in the 1600s. The Sherburne Coat of Arms on the outside wall of the Shireburne Chapel at All Hallows at Great Mitton with the date 1594. It is a combination of the Baileys and Shireburne coat of arms. The Baileys were the direct descendant’s of Otto de Mitton, grandson of “Ralph the Red” progenitor of the family’s male line. The Bayley-Shireburn marriage was considered to be so supremely important an event in the family history, that this quartered shield of the lions and eagles was considered to be in a special manner the family coat, although, both before and after the union, on account of marriages with other heiresses, other quarterings might be claimed. Thus we find the shield without additions, set up in various places of honour around Stonyhurst and the area. The arms are shown in the 1567 and 1613 Visitations, College of Arms, London. It reflects the blending of the Sherburne and Bailey families. Quartering Vert an Eagle displayed Argent for Bayley. Notes: This above Coat of Arms (description) was verified by a distant cousin (Shireburne) who researched the Sherburne family history while on a trip in England. Her tour included a visit to the ancestral home, Stonyhurst, in Lancashire, now a Jesuit college. She also verified the coat of arms in London. 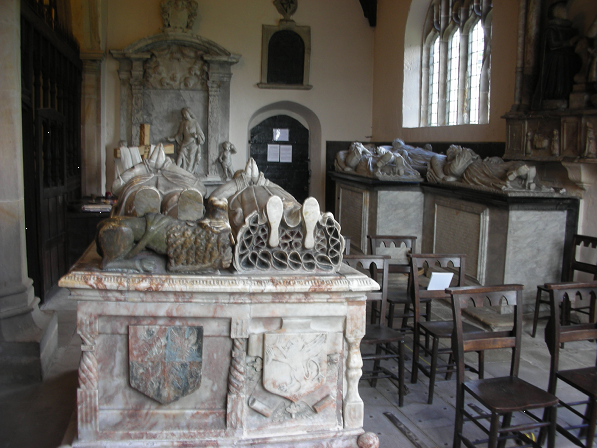 The effigies of Sir Richard Shireburne and his wife, Dame Maud (nee Bolt). On the right is the Rapacious Egale of the de Lacy family of the conquest. 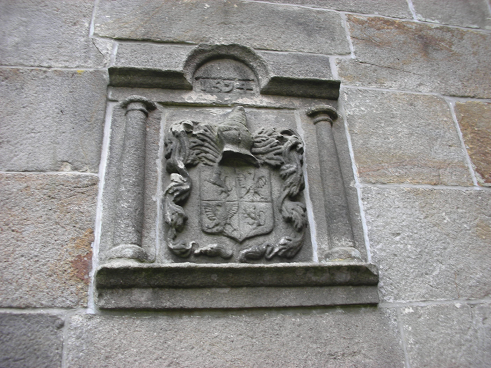 This same Egale is displayed on the other side of the effigie to denote the bloodline connection with the de Lacy family. The Shireburne Coat of Arms above on the tomb effigy at Mytton Churches Shirburn Chapel. The de Lacy ancestral bloodline connection to the Shireburnes is prominate on the effigies of Sir. Richard Shireburn, thus denoting the descent of the Shirburns from the de Lacy’sRalph the Red was the founder of this church. He was the illigetamat son of Robert de Lacy the first de Lacy Lord of Bowland and the successor of his father Ilbert de Lacy of the conquest and Pontefract castle. That de Lacy connection is predominate on the effigy below. It is the same stone carving (see below) on the death mask and relief at Walley Abby (see below) and the tombstone of John de Lacy signatory of Magna Carter. It is represenative of a "falcon bird rapaceus" a very aggresive bird that denotes the power of the de Lacy family. This was on Sir Richards effiegie to denote that family connection to the de Lacy`s thru the de Mitton`s as founders of this church. Sir Richard Shirburne`s effigy below with de Lacy “Rapaceus Eagle”. The same is on the other side denoting the family bloodline from the de Lacy`s. Henry de Lacy death mask with de Lacy “Rapaceus Eagle “ also on the tombstone at Walley Abby of John de Lacy the grandfather of Henry and signatory of magna carter. Henry de Lacy, 3rd Earl of Lincoln and Lord of Bowland and Pontefract`s death mask above and “Rapaceus Eagle” of the de Lacy family at Whalley Abby. The same “Rapaceus Eagle” is prominently displayed on the effigy of Sir Richard Shireburne at Mytton church denoting the Shireburns bloodline back to Ralph the Red, the illegitimate son of Robert de Lacy, Lord of Bowland. John de Lacy a signatory of Magna Carta: tombstone right at Whalley Abby with the “Repaceus Eagle” carved onto it as well as his grandsons, Henry de Lacy above. The coat of arms of Clitheroe Rural District Council: The white waves across the shield represent the four rivers of the Rural District – the Ribble, the Hodder, the Calder and the Loud. The green between these characteristics the predominantly rural countryside as well as incorporating an apt reference to the late Mr. James Green, M.B.E., J.P., the donor and at that time Chairman of the Council. 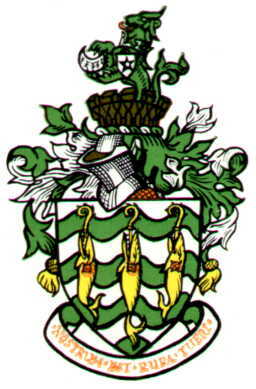 The three golden whales and croziers are from the arms of Whalley Abbey which exercised such a strong influence over the life and well being of this area in medieval times and ecclesiastical jurisdiction over a vast parish which included the whole of the Rural District. The red roses are for Lancashire. The battlements represent historic castle of Clitheroe, for Clitheroe Castle was originally a parish of this Rural District, its keep being depicted on the Council’s original seal. The coloring of the tower is note-worthy, for no other civic authority has a purple tower on its arms. This tincture derives from the purple lion of the de Lacy family who built the Norman castle at Clitheroe and enjoyed possession of the Honor of Clitheroe which included the manors of the present Rural District. The green lion derives from the heraldry of the Shireburnes of Stonyhurst and the ermine crescent is the emblem of the ancient Weld family. The golden coronet is from the arms of the illustrious Stanleys, Earls of Derby and the shield displays the arms of the Asshetons to mark their long association with this part of Lancashire. The late Sir Ralph C. Assheton, Bart. was the Council’s first Chairman. The motto defines the policy of this local authority administering a rural area which lies close to a number of the industrial centers of Lancashire.